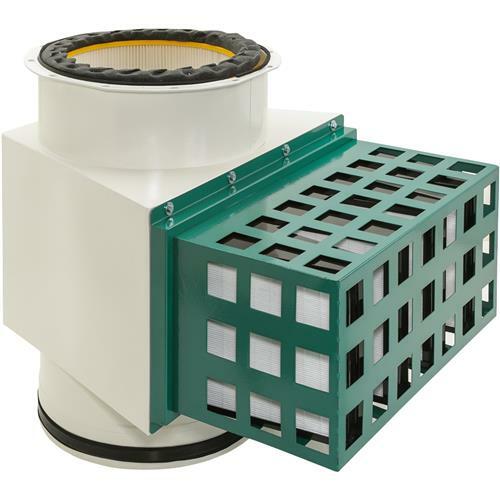 These Dual-Filtration HEPA Filter Upgrade Kits are specially designed for existing Grizzly cyclone owners who want to further reduce the amount of microscopic wood dust escaping from their current system. The internal (primary) filter captures 99.9% of particles 0.2-2 microns in size and includes an easy-cleaning brush system (similar to existing setup). The external (secondary) filter is HEPA certified to an efficiency of 99.97% at 0.3 microns, the same filtration level required in hospitals for surgical rooms. This dual-filtration design provides true HEPA filtration without quickly clogging or killing your airflow. Upgrading is easy! Just select the appropriate upgrade kit for your cyclone model, and follow the included instructions provided with the kit. This replaces your existing cartridge filters.